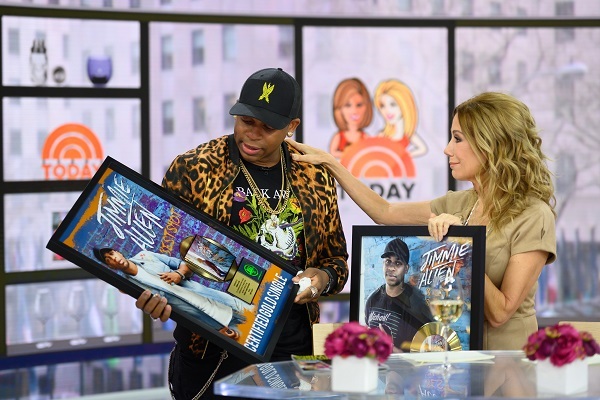 Country star and 2019 ACM Award nominee Jimmie Allen returned to co-host the fourth hour of NBC’s “TODAY with Kathie Lee and Hoda” for a second time yesterday, March 27. Filling in for an on-assignment Hoda Kotb, the appearance marks Allen’s sixth visit to the show in less than six months and makes him the last guest co-host for Kathie Lee Gifford who is leaving the show after 11 years next week. During the packed hour, Gifford surprised Allen with two plaques recognizing Gold Certification for his No. 1 single, “Best Shot,” in both the US and Canada. The duo also got a lesson in manners from Thomas Farley, checked out spring hair trends from celebrity hair stylist Chris Appleton and got in the kitchen with Craig Susser, owner of Craig’s in LA, to make scallops over cauliflower “risotto” primavera. His follow up single, “Make Me Want To,” is the second from Allen’s debut album Mercury Lane, which Rolling Stone praises as “a sturdy, hits-packed collection that… challenges the narrowly defined model of what constitutes a next big thing in country music.” “Make Me Want To” was most added at country radio with 61 stations reporting in the first week and is currently making its way up the chart. A first-time nominee at the 2019 ACM Awards (New Male Artist of the Year category), Allen also recently debuted a cover of the GRAMMY, Golden Globe and Academy Award-winning smash hit “Shallow” (see the video with fellow country newcomer, Abby Anderson here). Allen recently wrapped his supporting stint on Kane Brown’s Live Forever Tour and made his debut appearance at C2C, the U.K. and Ireland’s preeminent music festival. He will be hitting the road this summer as support on Chris Young’s Raised on Country Tour and Rascal Flatts’ Summer Playlist Tour as well as making an appearance on the CMA Fest Chevy Riverfront Stage in June.